Astronomie - Weihnachtskomet Lovejoy (C/2014 Q2). Astronomie - Bekommen zukünftige Weltraum-Teleskope Glitter Spiegel ? Raumfahrt-History - Ehemaliges Wernher von Braun Haus in Huntsville zu verkaufen. Astronomie - Ist Schwerkraft die Kraft, welche die Zeit nach Vorne treibt? The primary objectives for the Apollo 7 engineering test flight were simple: Demonstrate command and service module, or CSM, and crew performance; demonstrate crew, space vehicle and mission support facilities performance during a crewed CSM mission; and demonstrate CSM rendezvous capability. Oct. 11, 1968, was a hot day Cape Kennedy, but the heat was tempered by a pleasant breeze when Apollo 7 lifted off in a two-tongued blaze of orange-colored flames. 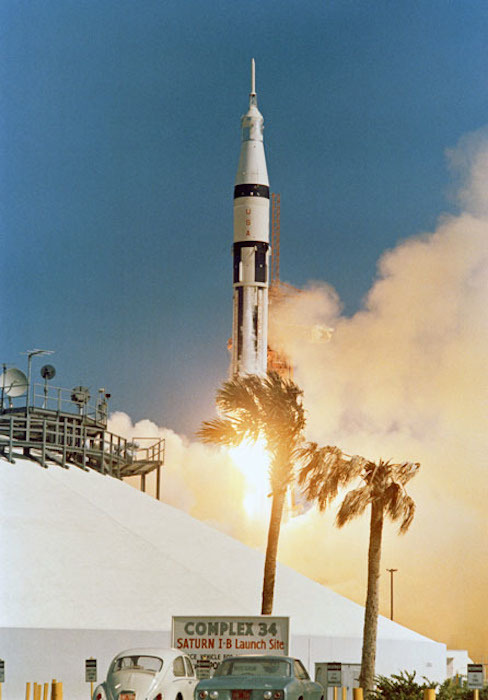 The Saturn IB, in its first trial with men aboard, provided a perfect launch, and its first stage dropped off two minutes, 25 seconds later. The S-IVB second stage took over, giving astronauts their first ride atop a load of liquid hydrogen. At five minutes, 54 seconds into the mission, Walter Schirra Jr., the commander, reported, "She is riding like a dream." About five minutes later, an elliptical orbit was achieved 140 by 183 miles above Earth. Once Apollo 7 cleared the pad, a three-shift mission control team -- led by flight directors Glynn Lunney, Eugene Kranz and Gerald D. Griffin -- in Houston took over. 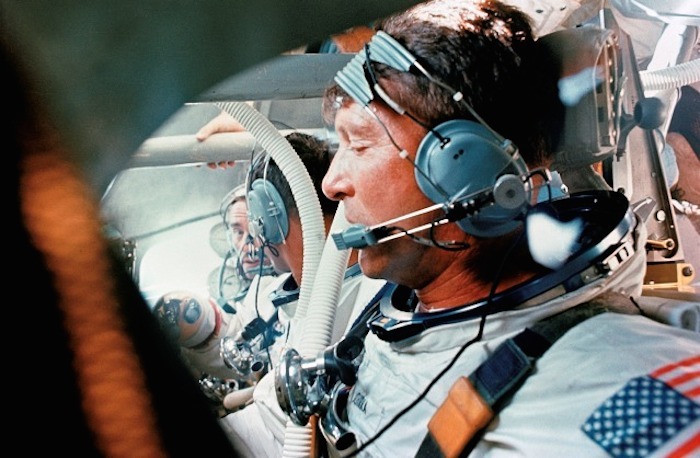 Schirra, Donn Eisele and R. Walter Cunningham inside the command module had heard the sound of propellants rushing into the firing chambers, noticed the vehicle swaying slightly and felt the vibrations at ignition. 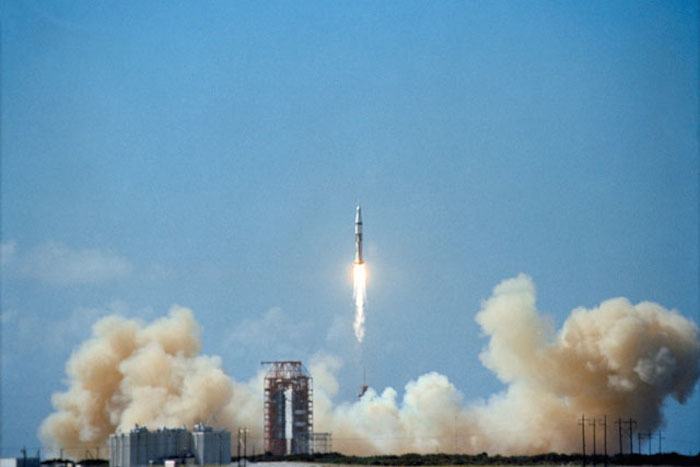 Ten and a half minutes after launch, with little bumpiness and low g loads during acceleration, Apollo 7 reached the first stage of its journey, an orbital path 227 by 285 kilometers above Earth. The S-IVB stayed with the CSM for about 1 1/2 orbits, then separated. Schirra fired the CSM's small rockets to pull 50 feet ahead of the S-IVB, then turned the spacecraft around to simulate docking, as would be necessary to extract an LM for a moon landing. The next day, when the CSM and the S-IVB were about 80 miles apart, Schirra and his crewmates sought out the lifeless, tumbling 59-foot craft in a rendezvous simulation and approached within 70 feet. 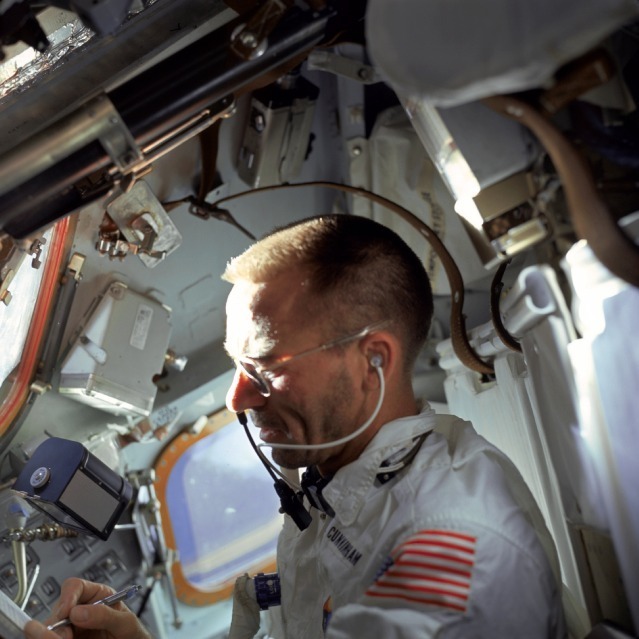 Cunningham reported the spacecraft lunar module adapter panels had not fully deployed, which naturally reminded Thomas Stafford, the mission's capsule communicator, or capcom, of the "angry alligator" target vehicle he had encountered on his Gemini IX mission. This mishap would have been embarrassing on a mission that carried a lunar module, but the panels would be jettisoned explosively on future flights. After this problem, service module engine performance was a joy. This was one area where the crew could not switch to a redundant or backup system. At crucial times during a lunar voyage, the engine simply had to work or they would not get back home. On Apollo 7, there were eight nearly perfect firings out of eight attempts. On the first, the crew had a real surprise. In contrast to the smooth liftoff of the Saturn, the blast from the service module engine jolted the astronauts, causing Schirra to yell "Yabadabadoo" like Fred Flintstone in the contemporary video cartoon. Later, Eisele said, "We didn't quite know what to expect, but we got more than we expected." He added more graphically it was a real boot in the rear that just plastered them into their seats. But the engine did what it was supposed to do each time it fired. The Apollo vehicle and the CSM performed superbly. Durability was shown for 10.8 days -- longer than a journey to the moon and back. With few exceptions, the other systems in the spacecraft operated as they should. Occasionally, one of the three fuel cells supplying electricity to the craft developed some unwanted high temperatures, but load-sharing hookups among the cells prevented any power shortage. The crew complained about noisy fans in the environmental circuits and turned one of them off. That did not help much, so the men switched off the other. The cabin stayed comfortable, although the coolant lines sweated and water collected in little puddles on the deck, which the crew expected after Joseph Kerwin's team test in the altitude chamber. Schirra's crew vacuumed the excess water out into space with the urine dump hose. A momentary shudder went through the Mission Control Center in Houston when both AC buses dropped out of the spacecraft's electrical system, coincident with automatic cycles of the cryogenic oxygen tank fans and heaters. Manual resetting of the AC bus breakers restored normal service. Three of the five spacecraft windows fogged because of improperly cured sealant compound, a condition that could not be fixed until Apollo 9. 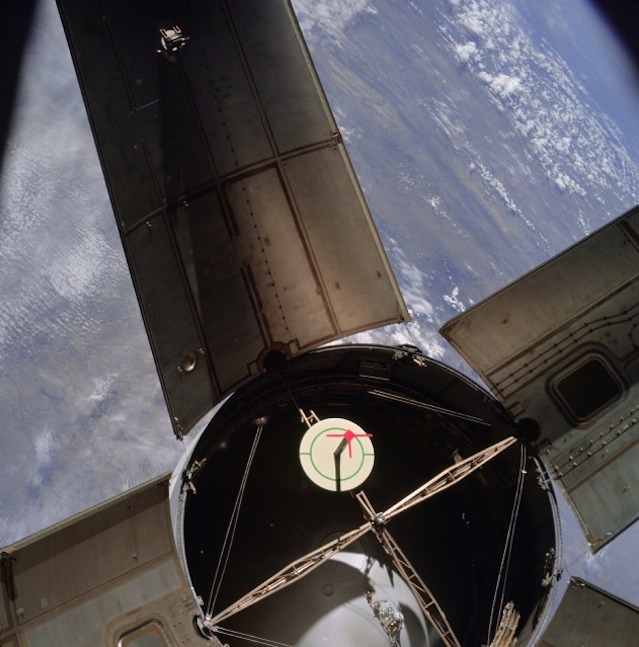 Visibility from the spacecraft windows ranged from poor to good during the mission. Shortly after the launch escape tower jettisoned, two of the windows had soot deposits and two others had water condensation. Two days later, however, Cunningham reported that most of the windows were in fairly good shape, although moisture was collecting between the inner panes of one window. On the seventh day, Schirra described essentially the same conditions. Even with these impediments, the windows were adequate. Those used for observations during rendezvous and station-keeping with the S-IVB remained almost clear. Navigational sighting with a telescope and a sextant on any of the 37 preselected Apollo stars was difficult if done too soon after a waste-water dump. Sometimes they had to wait several minutes for the frozen particles to disperse. Eisele reported that unless he could see at least 40 or 50 stars at a time he found it hard to decide what part of the sky he was looking toward. On the whole, however, the windows were satisfactory for general and landmark observations and for out-the-window photography. 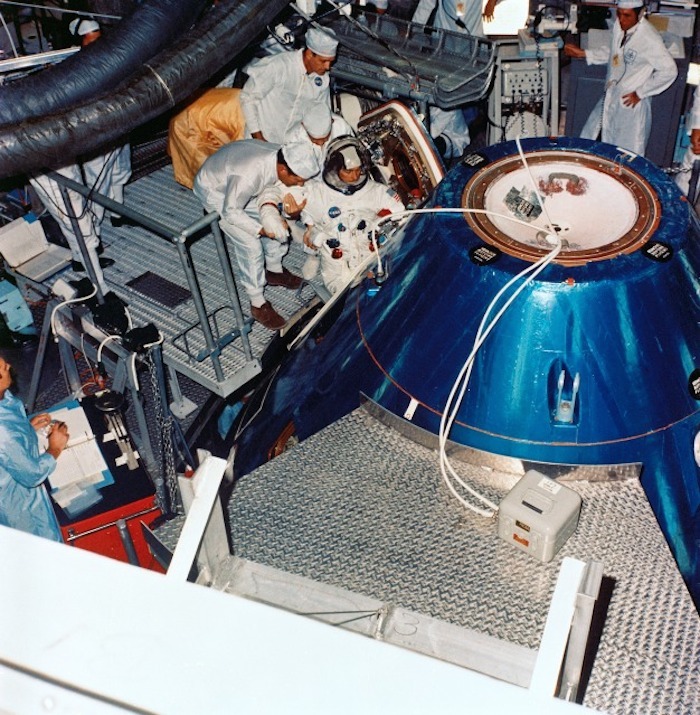 Despite minor irritations, such as smudging windows and puddling water, most components supported the operations and well-being of the spacecraft and crew as planned. For example, the waste management system for collecting solid body wastes was adequate, though annoying. The defecation bags containing a germicide to prevent bacteria and gas formation were easily sealed and stored in empty food containers in the equipment bay. But the bags certainly were not convenient and there were usually unpleasant odors. 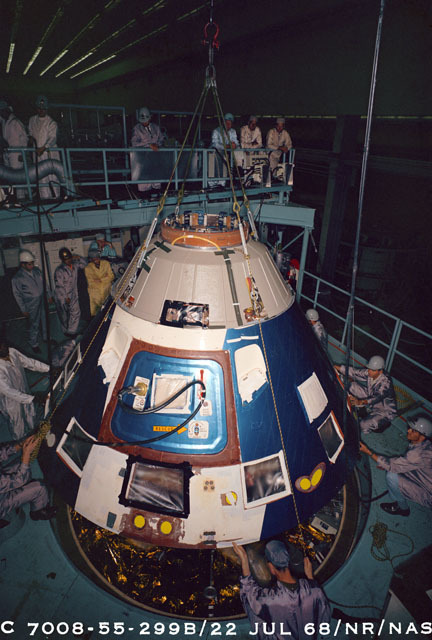 Each time they were used, it took crew members 45 to 60 minutes, causing them to wait for a time when there was no work to do and postponing it as long as possible. The crew had a total of only 12 defecations during a period of nearly 11 days. Urination was much easier, as the crew did not have to remove clothing. There was a collection service for both the pressure suits and the in-flight coveralls. Both devices could be attached to the urine dump hose and emptied into space. They had half expected the hose valve to freeze up in vacuum, but it never did. 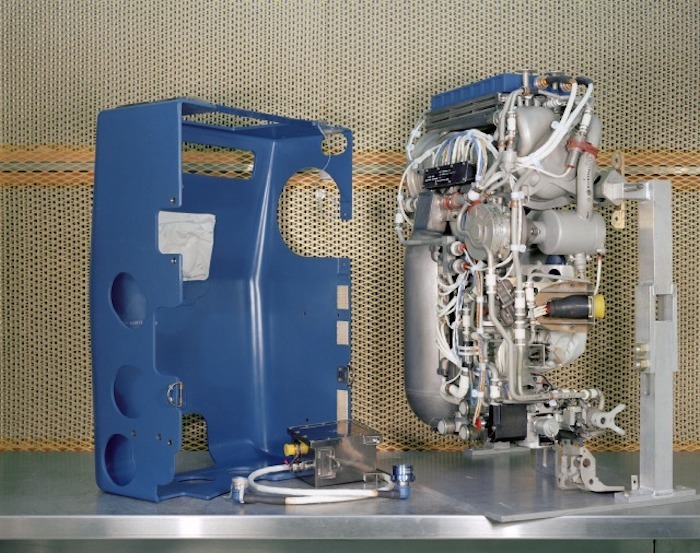 Chargers for the batteries needed for re-entry after fuel cells departed with the service module, or SM, returned 50-75 percent less energy than expected. Most serious was the overheating of fuel cells, which might have failed when the spacecraft was too far from Earth to return on batteries, even if fully charged. But each of these anomalies was satisfactorily checked out before Apollo 8 flew. Some of the crew's grumpiness during the mission could be attributed to physical discomfort. About 15 hours into the flight, Schirra developed a bad cold, and Cunningham and Eisele soon followed suit. A cold is uncomfortable enough on the ground, but in weightlessness it presents a different problem. Mucus accumulates, fills the nasal passages and does not drain from the head. The only relief is to blow hard, which is painful to the ear drums. 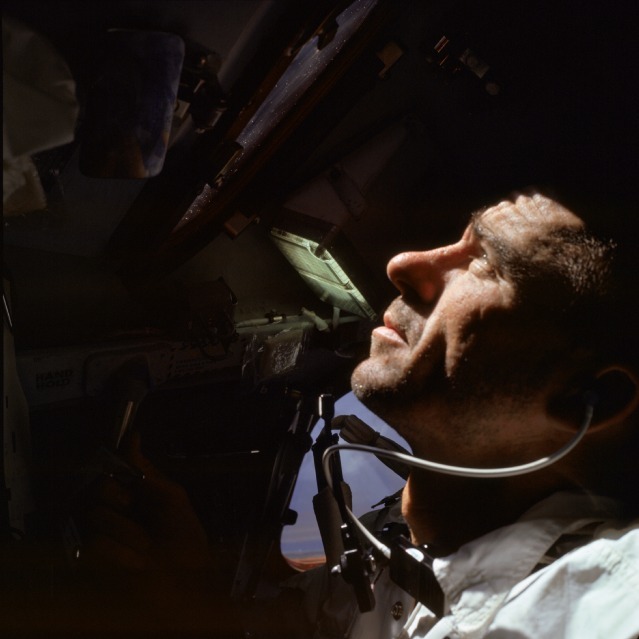 So the crew of Apollo 7 whirled through space suffering from stopped-up ears and noses. They took aspirin and decongestant tablets, and discussed their symptoms with doctors. 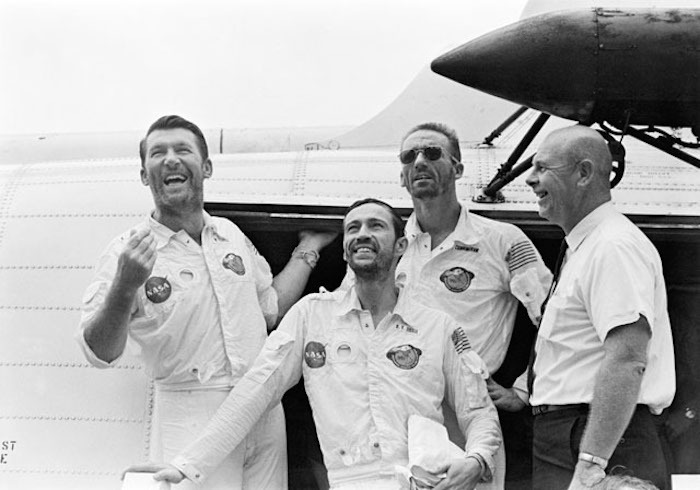 Several days before the mission ended, they began to worry about wearing their suit helmets during re-entry, which would prevent them from blowing their noses. The buildup of pressure might burst their eardrums. Deke Slayton in mission control tried to persuade them to wear the helmets anyway, but Schirra was adamant. They each took a decongestant pill about an hour before re-entry and made it through the acceleration zone without any problems with their ears. 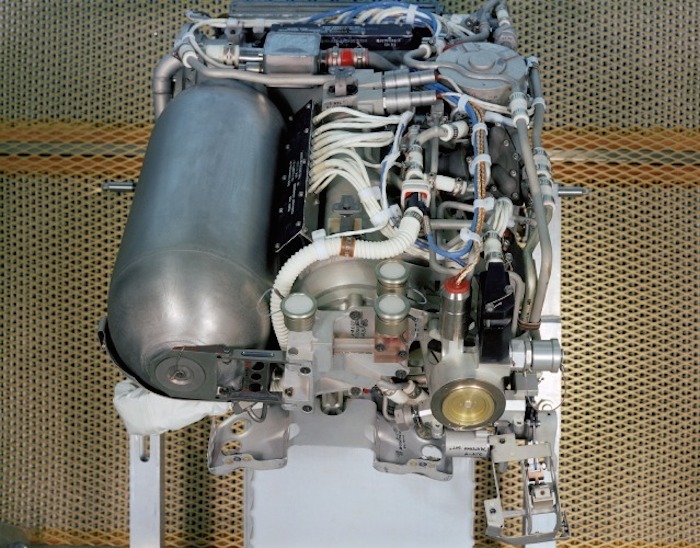 The CSM's service propulsion system, which had to fire the CSM into and out of the moon's orbit, worked perfectly during eight burns lasting from half a second to 67.6 seconds. 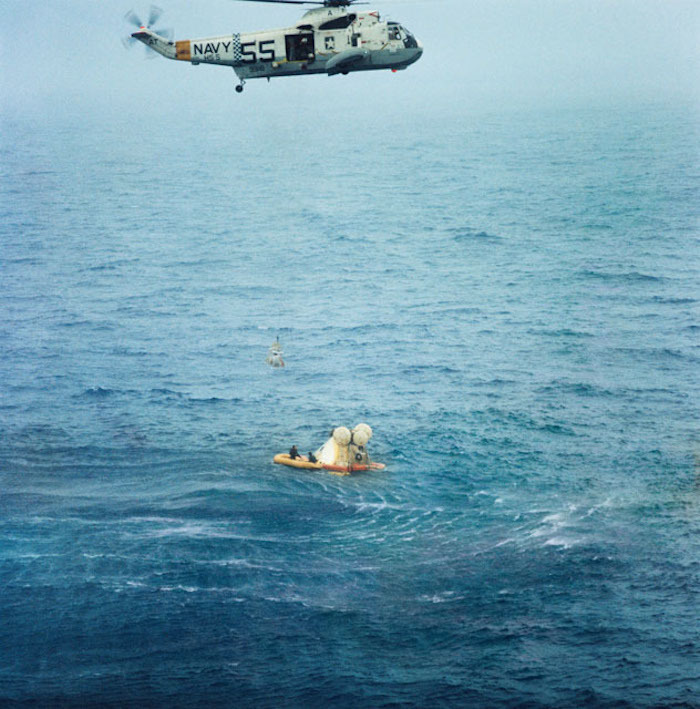 Apollo's flotation bags had their first try out when the spacecraft, considered a "lousy boat," splashed down in the Atlantic southeast of Bermuda, less than 2 kilometers from the planned impact point. Landing location was 27 degrees, 32 minutes north, and 64 degrees, four minutes west. The module turned upside down, but when inflated, the brightly colored bags flipped it upright. The tired, but happy, voyagers were picked up by helicopter and deposited on the deck of the USS Essex by 8:20 a.m. EDT. Spacecraft was aboard the ship at 9:03 a.m. EDT. 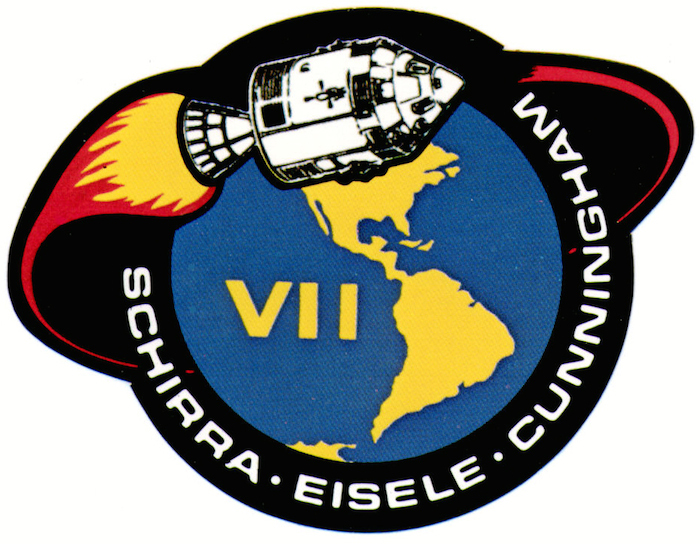 Apollo 7 accomplished what it set out to do -- qualifying the command and service module, and clearing the way for the proposed lunar orbit mission to follow. Its activities were of national interest. A special edition of NASA's news clipping collection called "Current News" included front page stories from 32 major newspapers scattered over the length and breadth of the nation. Although the post-mission celebrations may not have rivaled those for the first orbital flight of an American, John Glenn in 1962, enthusiasm was high and this fervor would build to even greater heights each time the lunar landing goal drew one step closer. In retrospect it seems inconceivable, but serious debate ensued in NASA councils on whether television should be broadcast from Apollo missions, and the decision to carry the little 4 1/2-pound camera was not made until just before this October flight. Although these early pictures were crude, it was informative for the public to see astronauts floating weightlessly in their roomy spacecraft, snatching floating objects and eating the first hot food consumed in space. Like the television pictures, the food improved on later missions. 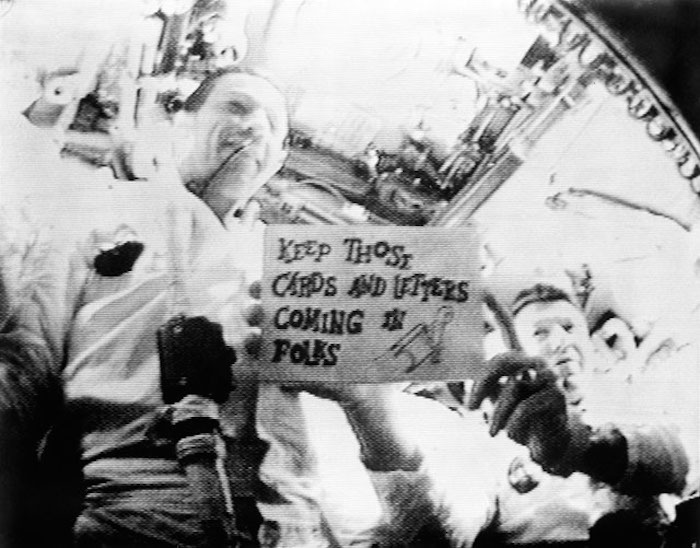 Apollo 7's achievement led to a rapid review of Apollo 8's options. The Apollo 7 astronauts went through six days of debriefing for the benefit of Apollo 8, and on Oct. 28, 1968, the Manned Space Flight Management Council chaired by George Mueller met at the Manned Spacecraft Center, investigating every phase of the forthcoming mission. The next day brought a lengthy systems review of Apollo 8's Spacecraft 103. Dr. Thomas O. Paine, NASA administrator, made the go/no-go review of lunar orbit on Nov. 11, 1968, at NASA Headquarters in Washington, D.C. By this time, nearly all the skeptics had become converts. 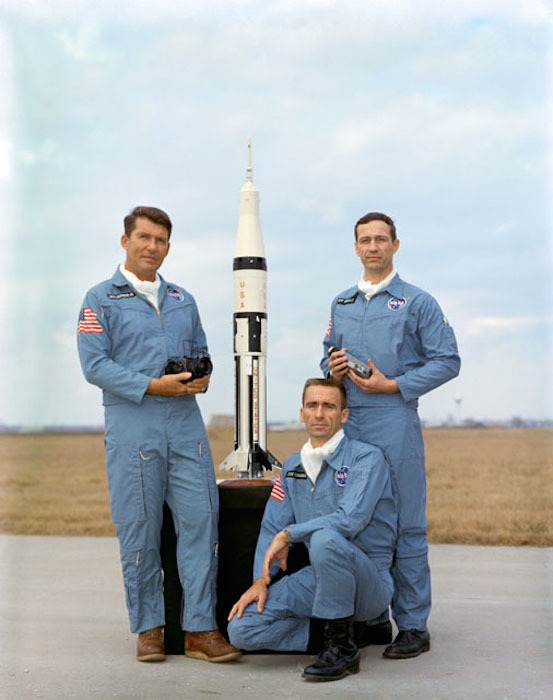 S68-21590 (September 1968) --- This is a portrait of the Apollo-Saturn 7 crew members. 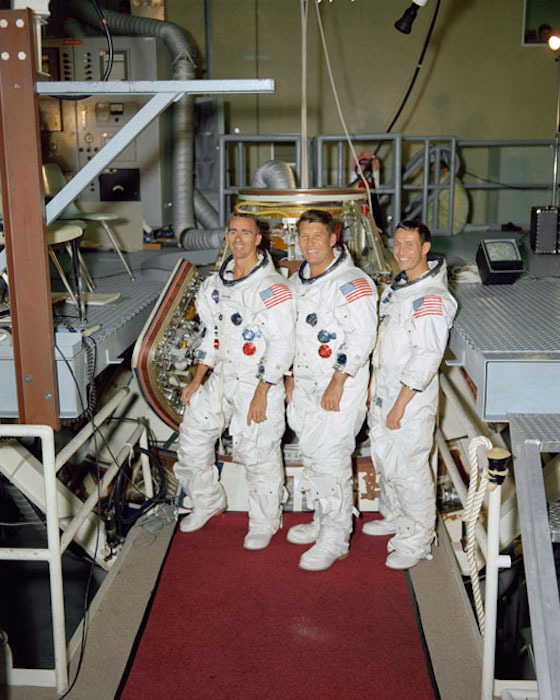 They are, left to right, astronauts Walter M. Schirra Jr., commander; Walter Cunningham, lunar module pilot; and Donn F. Eisele, command module pilot. EDITOR'S NOTE: Since this photograph was made astronaut Eisele died Dec. 2, 1987 in Tokyo, Japan, of a heart attack. S68-29781 (22 April 1968) --- Low angle view at the Kennedy Space Center's Pad 34 showing the erection of the first stage of the Saturn 205 launch vehicle. 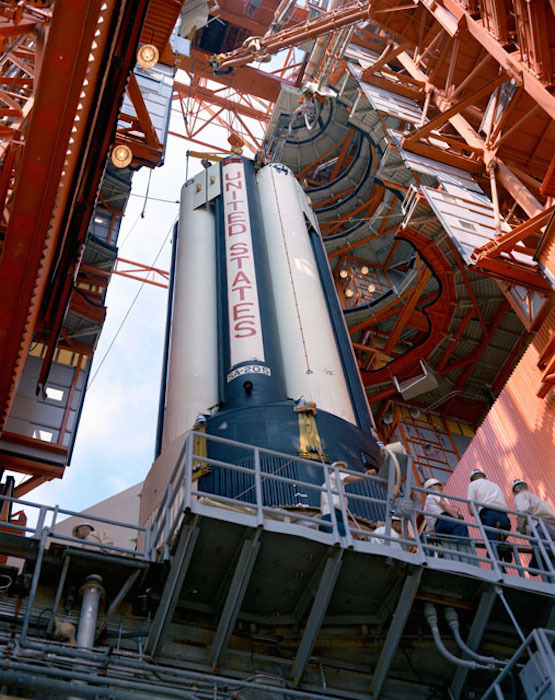 The two-stage Saturn IB will be the launch vehicle for the first unmanned Apollo space mission, Apollo 7 (Spacecraft 101/Saturn 205). S68-33119 (May 1968) --- The prime crew of the first manned Apollo space mission, Apollo 7 (Spacecraft 101/Saturn 205), left to right, are astronauts Walter Cunningham, lunar module pilot; Walter M. Schirra Jr., commander; and Donn F. Eisele, command module pilot. All are wearing their space suits without helmets. They were photographed during training at the North American Rockwell Facility at Downey, California. S68-33744 (22 May 1968) --- The prime crew of the first manned Apollo space mission, Apollo 7 (Spacecraft 101/Saturn 205), left to right, are astronauts Donn F. Eisele, command module pilot, Walter M. Schirra Jr., commander; and Walter Cunningham, lunar module pilot. S68-34580 (1968) --- With its exterior removed, the Apollo portable life support system (PLSS) can be easily studied. The PLSS is worn as a backpack over the Extravehicular Mobility Unit (EMU), a multi-layered spacesuit used for outside-the-spacecraft activity. JSC photographic frame no. S68-34582 is a close-up view of the working parts of the PLSS. S68-34582 (1968) --- With its exterior removed, the Apollo portable life support system (PLSS) can be easily studied. The PLSS is worn as a backpack over the Extravehicular Mobility Unit (EMU) a multi-layered spacesuit used for outside-the-spacecraft activity. JSC photographic frame no. S68-34582 is a wider view of the exposed interior working parts of the PLSS and its removed cover. S68-40875 (5 July 1968) --- Astronaut John W. Young, Apollo 7 backup command module pilot, ingresses Apollo Spacecraft 101 Command Module during simulated altitude runs at the Kennedy Space Center's Pad 34. S68-42343 (5 Aug. 1968) --- The prime crew of the first manned Apollo space mission, Apollo 7, stands on the deck of the NASA Motor Vessel Retriever after suiting up for water egress training in the Gulf of Mexico. Left to right, are astronauts Walter Cunningham, Donn F. Eisele, and Walter M. Schirra Jr.
S68-42486 (22 July 1968) --- Wide-angle view of Apollo Command Module 103 during de-stacking from Service Module in Stand 2C. S68-42513 (5 Aug. 1968) --- Apollo Spacecraft 101 Command/Service Modules being moved into position for mating with Spacecraft Lunar Module Adapter (SLA)-5 in the Kennedy Space Center's Manned Spacecraft Operations Building. 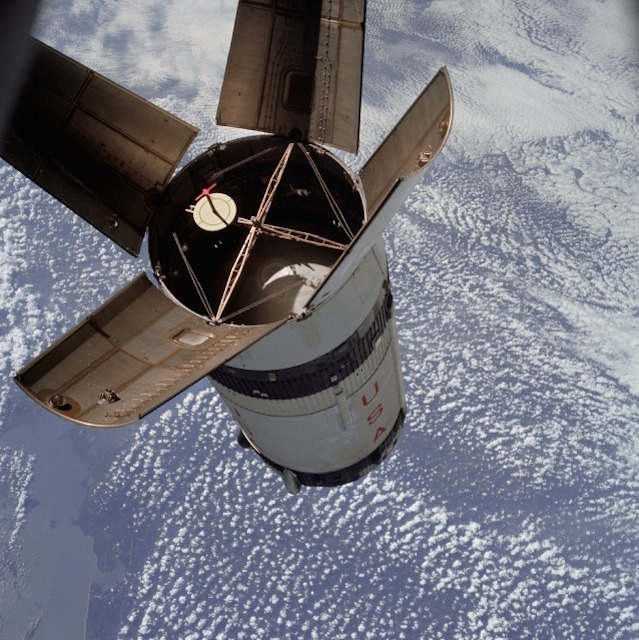 Apollo Spacecraft 101 will be flown on the first manned Apollo space mission, Apollo 7 (Spacecraft 101/Saturn 205). 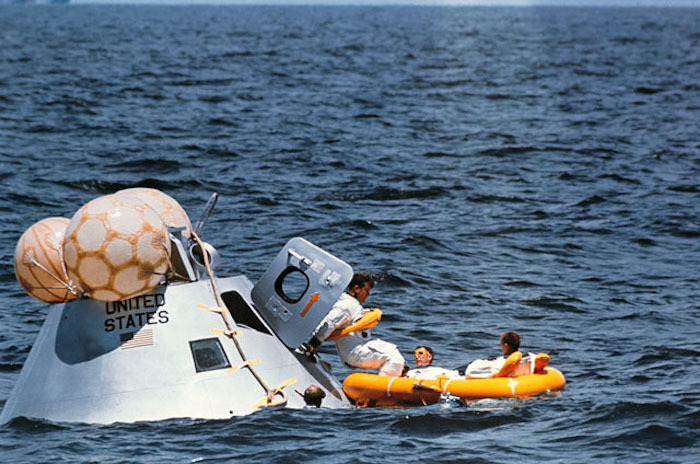 S68-46604 (5 Aug. 1968) --- The prime crew of the first manned Apollo mission (Spacecraft 101/Saturn 205) is seen in Apollo Command Module Boilerplate 1102 during water egress training in the Gulf of Mexico. In foreground is astronaut Walter M. Schirra Jr., in center is astronaut Donn F. Eisele, and in background is astronaut Walter Cunningham. S68-46605 (5 Aug. 1968) --- The prime crew of the first manned Apollo mission (Spacecraft 101/Saturn 205) participates in water egress training in the Gulf of Mexico. Left to right, are astronauts Walter M. Schirra Jr. (stepping into life raft), Donn F. Eisele, and Walter Cunningham. They have just egressed Apollo Command Module Boilerplate 1102, and are awaiting helicopter pickup. Inflated bags were used to upright the boilerplate. MSC swimmers assisted in the training exercise. 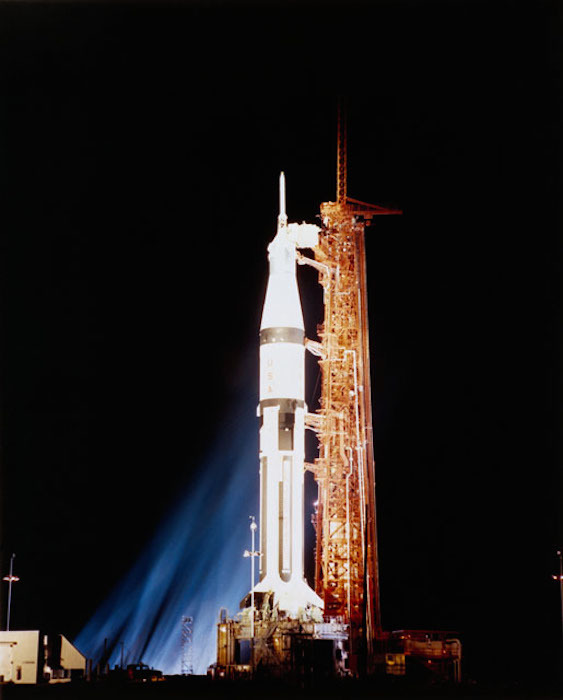 S68-50712 (16 Sept. 1968) --- Nighttime view of Launch Complex 34, Kennedy Space Center, showing the Apollo 7 (Spacecraft 101/Saturn 205) stack on pad. S68-48787 (11 Oct. 1968) --- The Apollo 7/Saturn IB space vehicle is launched from the Kennedy Space Center's Launch Complex 34 at 11:03 a.m. on Oct. 11, 1968. S68-48666 (11 Oct. 1968) --- The Apollo 7/Saturn IB space vehicle is launched from the Kennedy Space Center's Launch Complex 34 at 11:03 a.m. (EDT), Oct. 11, 1968. Apollo 7 (Spacecraft 101/Saturn 205) is the first of several manned flights aimed at qualifying the spacecraft for the half-million-mile round trip to the moon. 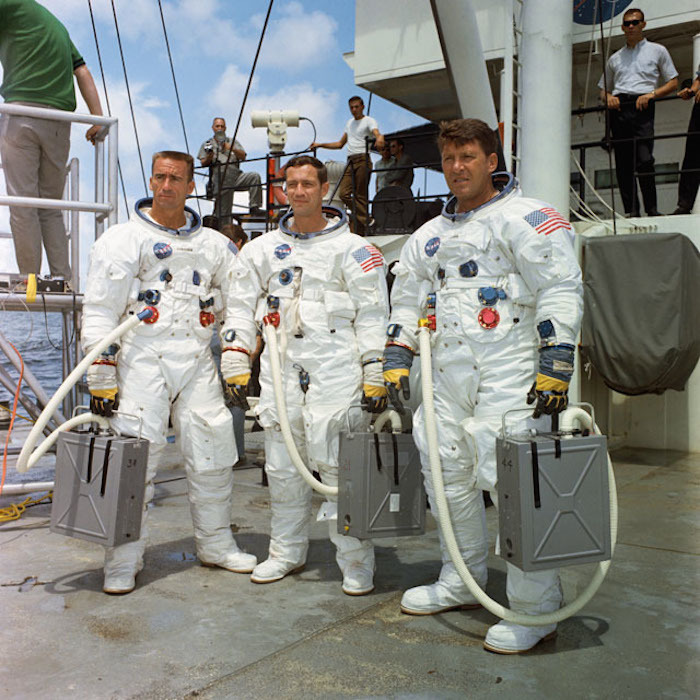 Aboard the Apollo spacecraft are astronauts Walter M. Schirra Jr., commander; Donn F. Eisele, command module pilot; and Walter Cunningham, lunar module pilot. 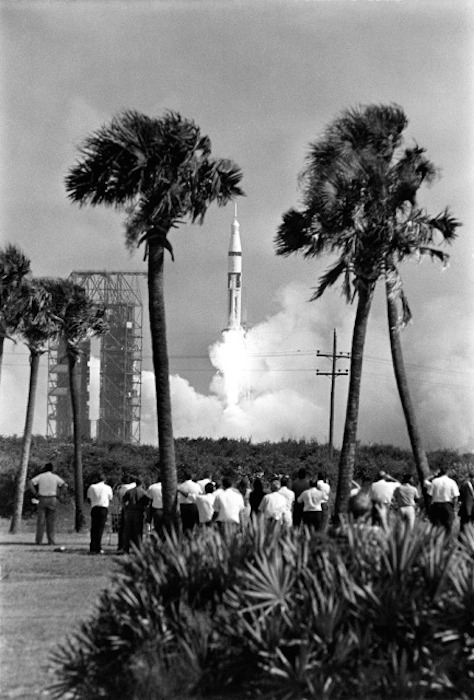 S68-48662 (11 Oct. 1968) --- The Apollo 7/Saturn IB space vehicle is launched from the Kennedy Space Center's Launch Complex 34 at 11:03 a.m. (EDT), Oct. 11, 1968. Apollo 7 (Spacecraft 101/Saturn 205) is the first of several manned flights aimed at qualifying the spacecraft for the half-million mile round trip to the moon. 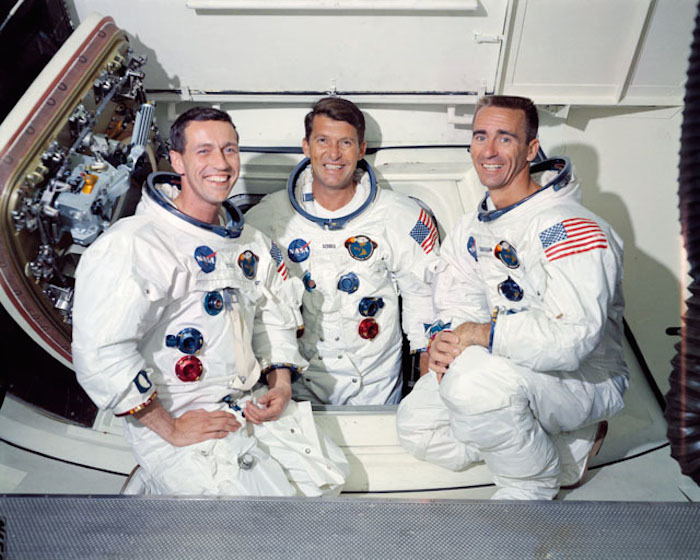 Aboard the Apollo spacecraft are astronauts Walter M. Schirra Jr., commander; Donn F. Eisele, command module pilot; and Walter Cunningham, lunar module pilot. (This view is framed by palm trees on either side). AS07-04-1584 (11-22 Oct. 1968) --- Astronaut Walter Cunningham, Apollo 7 lunar module pilot, is photographed during the Apollo 7 mission. 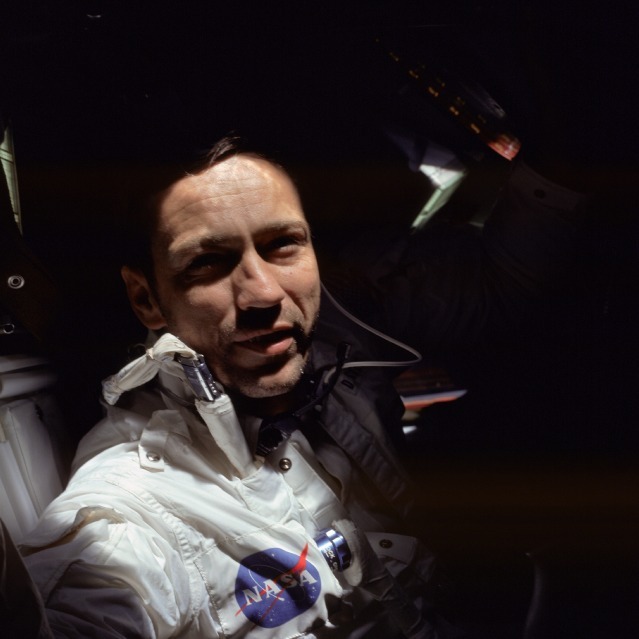 AS07-04-1583 (11-22 Oct. 1968) --- Astronaut Donn F. Eisele, Apollo 7 command pilot, is photographed during the Apollo 7 mission. 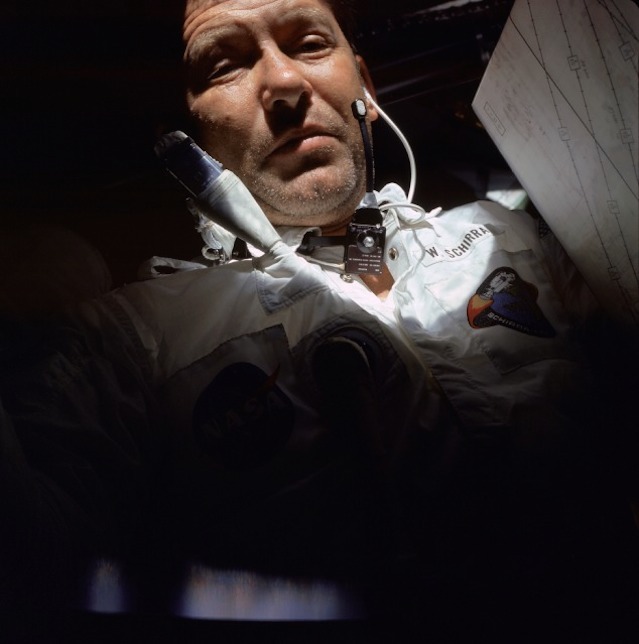 AS07-04-1582 (11-22 Oct. 1968) --- Astronaut Walter M. Schirra Jr., Apollo 7 commander, is photographed during the Apollo 7 mission. 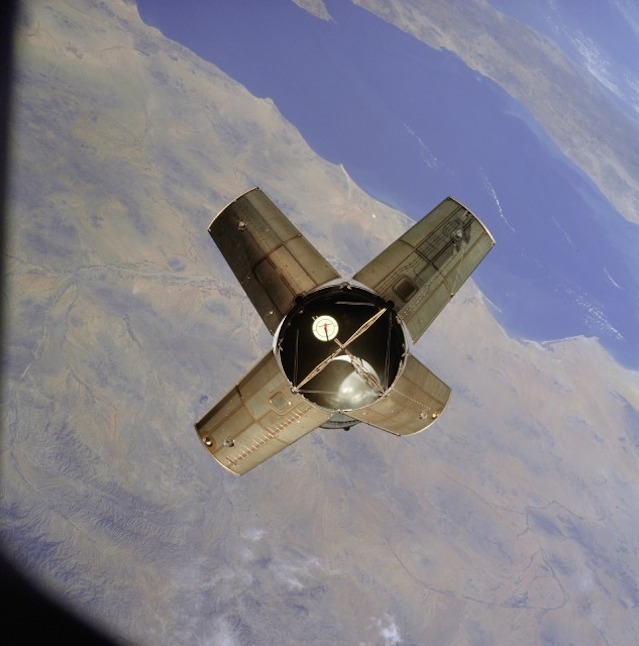 AS07-03-1535 (11 Oct. 1968) --- The expended Saturn IVB stage as photographed from the Apollo 7 spacecraft during transposition and docking maneuvers at an altitude of 126 nautical miles, at ground elapsed time of three hours, 11 minutes. 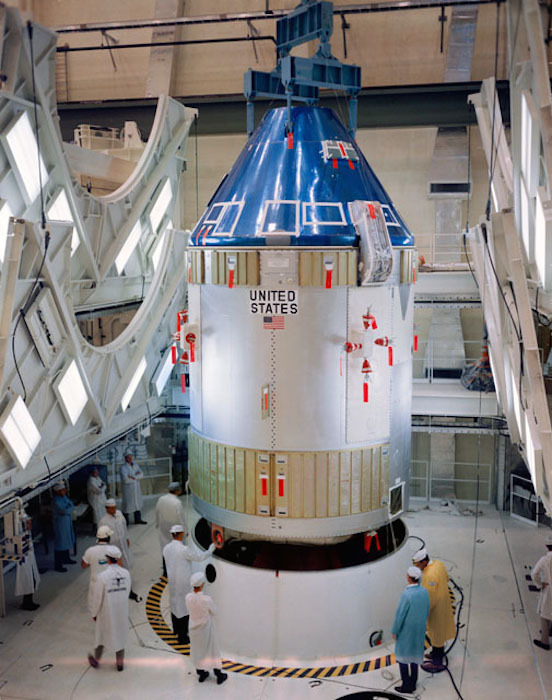 The round, white disc inside the open panels of the Saturn IVB is a simulated docking target similar to that used on the lunar module for docking during lunar missions. The spacecraft is directly over Odessa-Midland, Texas. The view between the two panels (area of large puffy clouds) extends southwest across Texas into the Mexican State of Chihuahua. 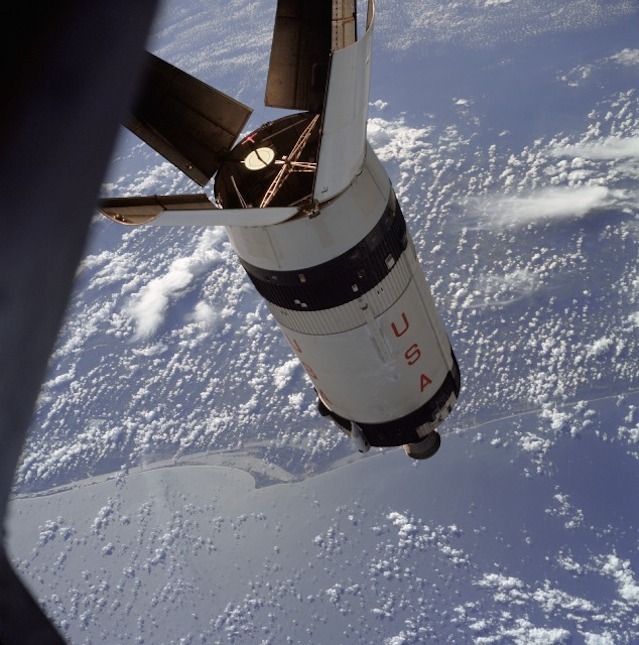 The distance between the Apollo 7 spacecraft and the S-IVB is approximately 50 feet. AS07-03-1538 (11 Oct. 1968) --- The expended Saturn IVB stage as photographed from the Apollo 7 spacecraft during transposition and docking maneuvers. This photograph was taken during Apollo 7's second revolution of Earth. Earth below has heavy cloud cover. The round, white disc inside the open panels of the Saturn IVB is a simulated docking target similar to that used on the lunar module for docking during lunar missions. AS07-03-1541 (11 Oct. 1968) --- The expended Saturn IVB stage as photographed from the Apollo 7 spacecraft during transposition and docking maneuvers. St. Louis Bay and Lake Borgne area just east of New Orleans is seen below. The round, white disc inside the open panels of the Saturn IVB is a simulated docking target similar to that used on the lunar module for docking during lunar missions. AS07-03-1545 (11 Oct. 1968) --- The expended Saturn S-IVB stage as photographed from the Apollo 7 spacecraft during transposition and docking maneuvers at an approximate altitude of 125 nautical miles, at ground elapsed time of three hours and 16 minutes (beginning of third revolution). This view is over the Atlantic Ocean off the coast of Cape Kennedy, Florida. The Florida coastline from Flagler Beach southward to Vero Beach is clearly visible in picture. Much of the Florida peninsula can be seen. Behind the open panels is the Gulf of Mexico. Distance between the Apollo 7 spacecraft and the S-IVB is approximately 100 feet. 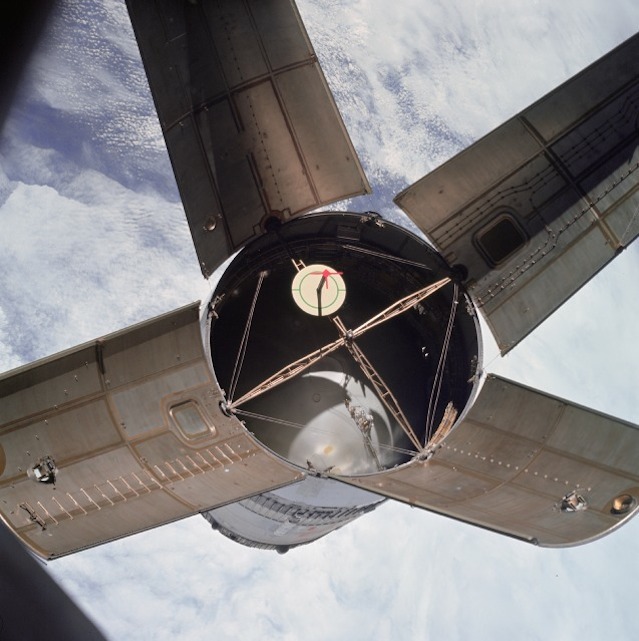 The round, white disc inside the open panels of the S-IVB is a simulated docking target similar to that used on the Lunar Module (LM) for docking during lunar missions. AS07-03-1531 (11 Oct. 1968) --- The expended Saturn IVB stage as photographed from the Apollo 7 spacecraft during transposition and docking maneuvers. This photograph was taken over Sonora, Mexico, during Apollo 7's second revolution of Earth. The round, white disc inside the open panels of the Saturn IVB is a simulated docking target similar to that used on the lunar module for docking during lunar missions. AS07-04-1586 (20 Oct. 1968) --- Astronaut Walter Cunningham, Apollo 7 lunar module pilot, writes with space pen as he is photographed performing flight tasks on the ninth day of the Apollo 7 mission. Note the 70mm Hasselblad camera film magazine just above Cunningham's right hand floating in the weightless (zero gravity) environment of the spacecraft. 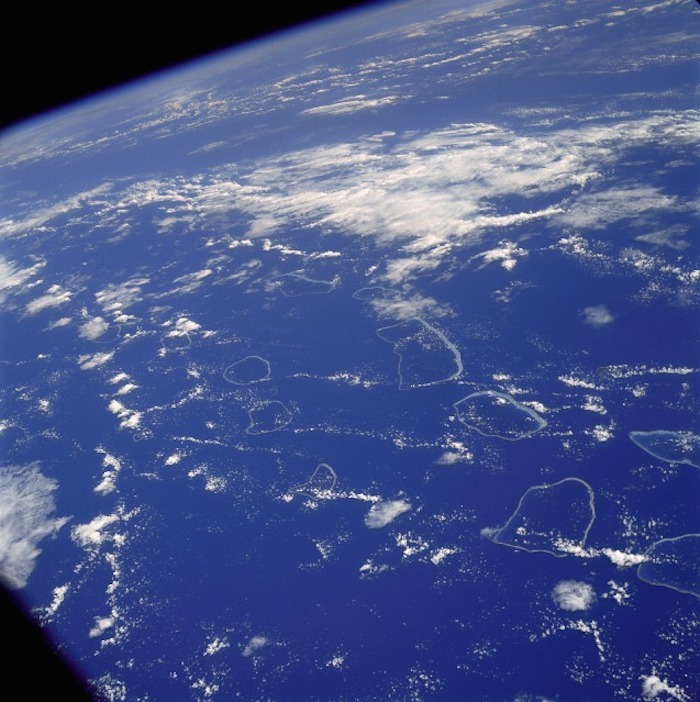 AS07-04-1590 (20 Oct. 1968) --- Tuamotu Archipelago in the South Pacific Ocean, looking southwest, as photographed from the Apollo 7 spacecraft during its 141st revolution of Earth. The photograph was taken from an altitude of 110 nautical miles, at a ground elapsed time of 224 hours and 18 minutes. 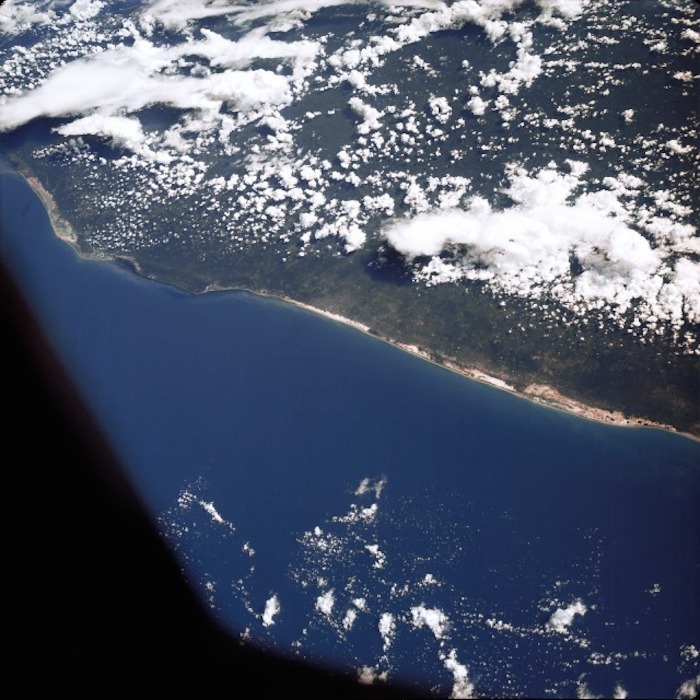 AS07-05-1635 (13 Oct. 1968) --- Gulf of Mexico, coast of Yucatan, Mexico, as seen from the Apollo 7 spacecraft during its 33rd revolution of Earth. Note road leading to city of Merida which is under cloud cover. Photographed from an altitude of 123 nautical miles, at ground elapsed time of 52 hours and 37 minutes. 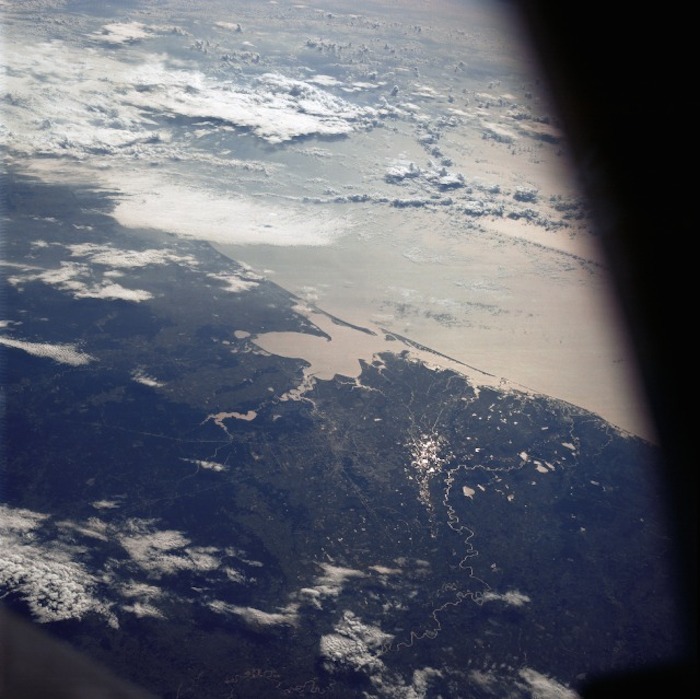 AS07-07-1872 (11-22 Oct. 1968) --- The Houston, Texas, and Gulf Coast area, looking southeast, as seen from the Apollo 7 spacecraft at an altitude of 101 nautical miles. This photograph was made during the spacecraft's 91st revolution of Earth, at ground elapsed time of 144 hours and 26 minutes. The morning sun causes a spectacular reflection on water surfaces such as the Gulf of Mexico, Galveston Bay, Buffalo Bayou, and the Brazos River, and causes a unique reflection in the canals and rice fields west of Alvin. Some of the landmarks visible in this picture include highways and freeways, the Astrodome, the new Intercontinental Airport, and the Manned Spacecraft Center. 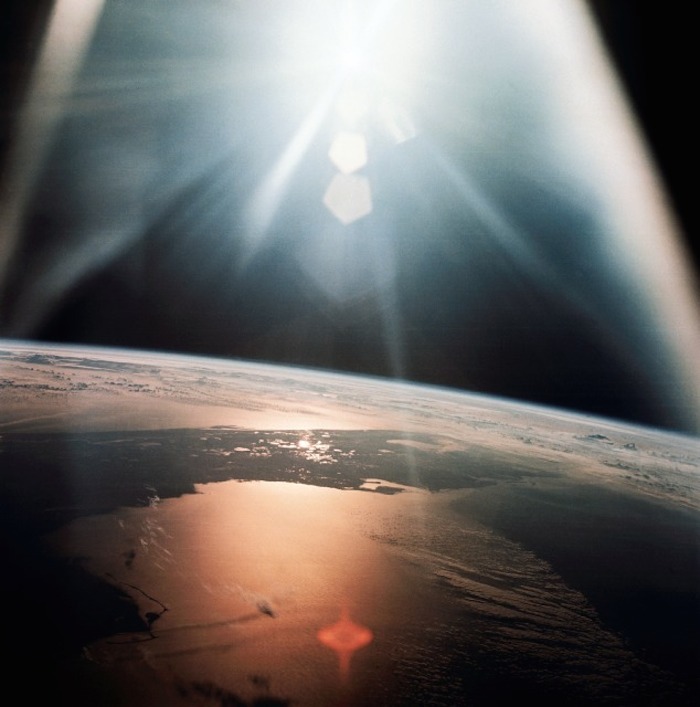 AS07-08-1933 (20 Oct. 1968) --- The morning sun reflects on the Gulf of Mexico and the Atlantic Ocean as seen from the Apollo 7 spacecraft at an altitude of 120 nautical miles above Earth. Most of Florida peninsula appears as a dark silhouette. This photograph was made during the spacecraft's 134th revolution of Earth, some 213 hours and 19 minutes after liftoff. S68-50713 (14 Oct. 1968) --- Astronauts Walter M. Schirra Jr. (on right), mission commander; and Donn F. Eisele, command module pilot; are seen in the first live television transmission from space. Schirra is holding a sign which reads, "Keep those cards and letters coming in, folks!" Out of view at left is astronaut Walter Cunningham, lunar module pilot. S68-49661 (22 Oct. 1968) --- A member of the Apollo 7 crew is hoisted up to a recovery helicopter from the USS Essex during recovery operations. The Apollo 7 spacecraft splashed down at 7:11 a.m., Oct. 22, 1968, approximately 200 nautical miles south-southwest of Bermuda. S68-52542 (22 Oct. 1968) --- The Apollo 7 crew arrives aboard the USS Essex, the prime recovery ship for the mission. Left to right, are astronauts Walter M. Schirra Jr., commander; Donn F. Eisele, command module pilot; Walter Cunningham, lunar module pilot; and Dr. Donald E. Stullken, NASA Recovery Team Leader from the Manned Spacecraft Center's (MSC) Landing and Recovery Division. The crew is pausing in the doorway of the recovery helicopter. 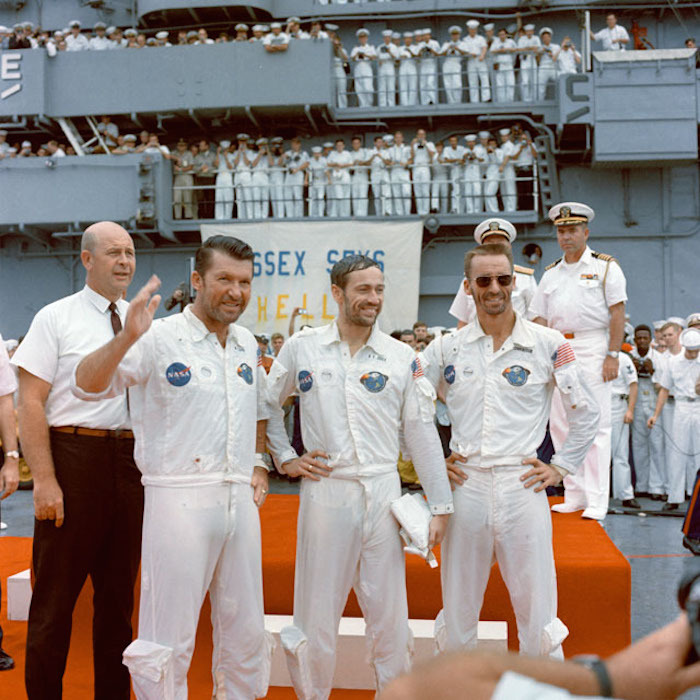 S68-49744 (22 Oct. 1968) --- The Apollo 7 crew is welcomed aboard the USS Essex, the prime recovery ship for the mission. Left to right, are astronauts Walter M. Schirra Jr., commander; Donn F. Eisele, command module pilot; and Walter Cunningham, lunar module pilot. In left background is Dr. Donald E. Stullken, NASA Recovery Team Leader from the Manned Spacecraft Center's (MSC) Landing and Recovery Division.